A request for help from C3Europe. C3 Foundation Europe has a MAJOR project underway. The opportunity of a lifetime for us. If successful, it will mean a huge amount of tv exposure for us and The Sinclair Method, in addition to a potentially large amount of funding. At this stage, I cannot give more details than this, other than to say that out of a very small number of charities, we have already been pre-selected, by the relevant organisation, to apply for this wonderful opportunity. I need to provide a 3 minute video for submission to the decision makers, explaining what we do, what our future plans are, etc etc. What I would like to do in this video is have a small, scrolling section of images that runs along the bottom of the video as I speak, and this scrolling section will show pictures of those who have used, or are currently using The Sinclair Method. Three minutes isn't long. My aim is to convey the 'human' element of what we do, and there is no better way I can think of to do that, other than the decision-makers actually seeing those we have helped. Please note, this video will NOT go on television, it is simply the first step of the application process. In order for it to be viewed by the decision-makers, it will be watchable on our website for a few weeks at most. Once it has been viewed by the relevant people and a decision has been made as to whether we have succeeded in this first stage of the application, then I will remove the video. The expected date for removal would be week ending Friday 12th October 2018. So, if you are using naltrexone or nalmefene as per The Sinclair Method and would feel comfortable helping out with a picture for use in this video, please PM me and I will give you my email address to send it too. The picture can be any pose, and in fact, the more fun the photo, the better since it will show that recovery is such a positive thing, and ultimately leads to better things. Walking the dog? Hiking? Skiing? Cycling? Knitting? Anything, really. It really doesn't matter as long as you have used TSM and have received some form of help, information or support from either myself personally, our websites, facebook pages, forums, or from anyone involved in C3. You may remember that a little while ago, we posted that we'd been shortlisted for The People's Project for 2019 in association with the TV station, ITV, and the UK's National Lottery. 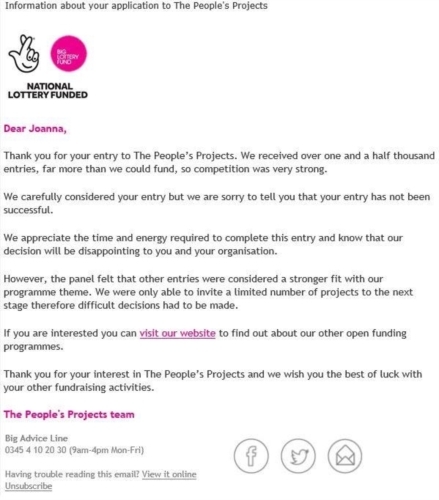 Sadly, we didn't make it past the first stage, but given the number of projects they fund, we regard even being shortlisted as a huge feather in our caps. And once again, many, many thanks to all of you who so kindly sent us photos to use in our video presentation.